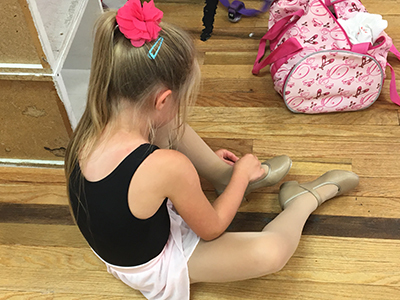 Dance attire is a huge part of dance etiquette and can even determine a dancer’s success in class. Here is a guideline for what to wear in dance classes at Charleston Dance Center. If you have questions, please don’t hesitate to contact us! Any style or color leotard, tights, dance dresses, skirts, tutus, jazz shorts, etc. Tan tie tap shoes, pink ballet shoes, and dance bag. Hair pulled securely back from face and neck. Solid black leotard, pink tights, pink ballet shoes, hair pulled back in a secure bun with hairspray, bobby pins and a hairnet. Boys should wear black tights, leotard or tank top, black ballet shoes. Any color or style dancewear as long as legs below the knee and feet are not covered. Tap I and below wear tan mary jane style shoes. Tap II and above wear tan lace-up shoes. Boys should wear gym shorts or sweat pants, t-shirt or tank top, black tap shoes. Lyricra/cotton fitted jazz shorts (booty shorts) or leggings, tight fitted cami, top, tank, or bra top. Tan jazz shoes (our competition teams wear Bloch Super Jazz). Tan tights are likely required for recital. Hair securely pulled back from face and neck. Boys should wear comfortable clothing they can move in – nothing overly baggy – and black jazz shoes. We encourage stylish, trendy attire including sweatpants, leggings, tees, tank tops, hoodies, basketball shorts, jazz clothes etc. Shoes are sneakers or combat boots (no bare feet in hip hop). Lyrical/cotton fitted jazz shorts (booty shorts), tight fitted cami, top, tank, or bra top. No shoes required. Hair pulled securely back from face and neck. Boys should wear comfortable clothing they can move in – nothing overly baggy.